Hope everyone is having a wonderful April, with all this gorgeous weather..the Oak Pollen is the only downside right now, and hopefully a little more rain will get rid of it ! 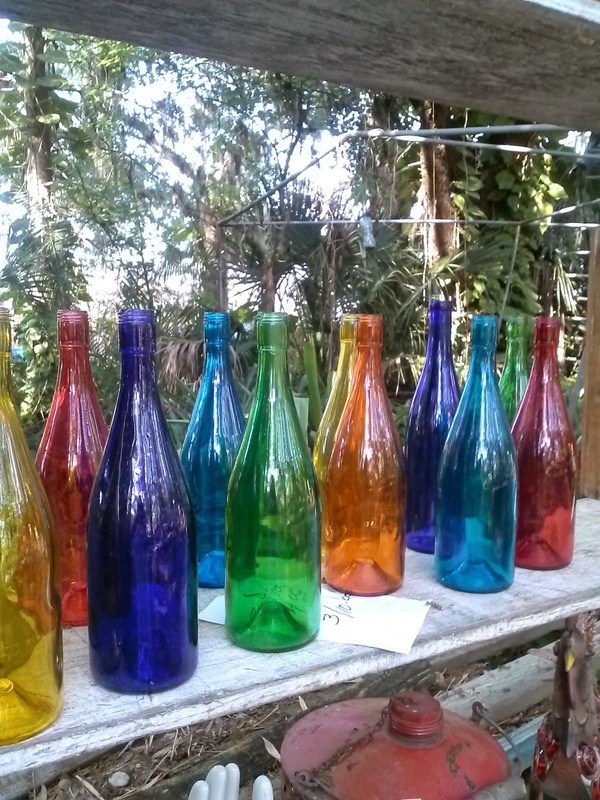 We had an exhausting but wonderful weekend last Fri-Sun covering our shows at Wintergarden and Tropiflora nursery in Sarasota. This weekend, we will be back to our home place, at the Saturday Morning Market in downtown St. Pete tomorrow, and the following weekend. Then comes the big Green Thumb festival the end of this month! Thought I would share some pics of some very cool stuff that we brought home from the Tropiflora show. 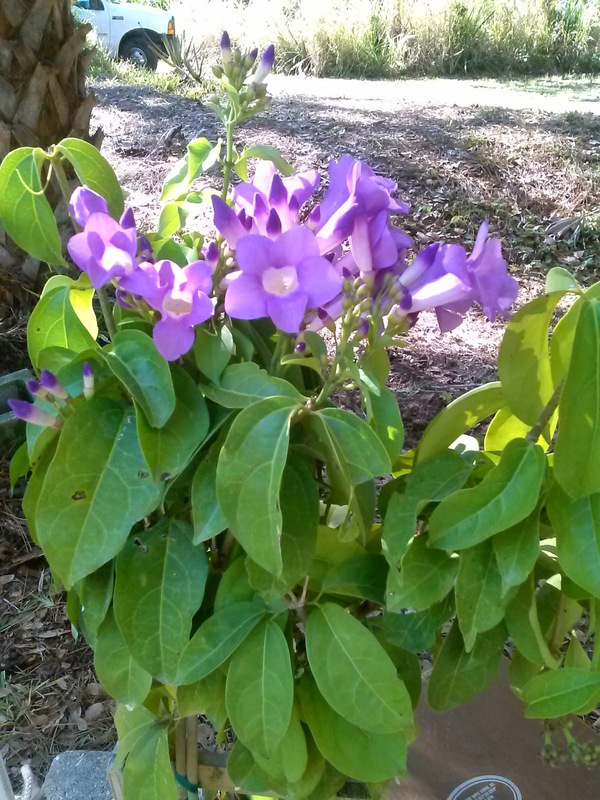 To the left here is a "Garlic" Vine...yes, has a bit of hint of the aroma and the lavender flowers are to die for. Bringing this to market tomorrow to see if someone wants to give her a good home. Seems that everyone is doing Bottle Trees nowadays and it's time for me to step on the band wagon. Typically you just see them done with blue bottles, but a fellow vendor, Wentz Antiques, brought these to the show and I could not resist getting one in every color. Now all I have to do, is get Mitch to build the "tree base". I did a quick research on the Bottle trees and one of the stories I found out was that the bottle trees originated from Africa, where families would have them outside their homes, to trap evil spirits and keep them safe. The color blue was used specifically because it's a color of warmth and serenity. 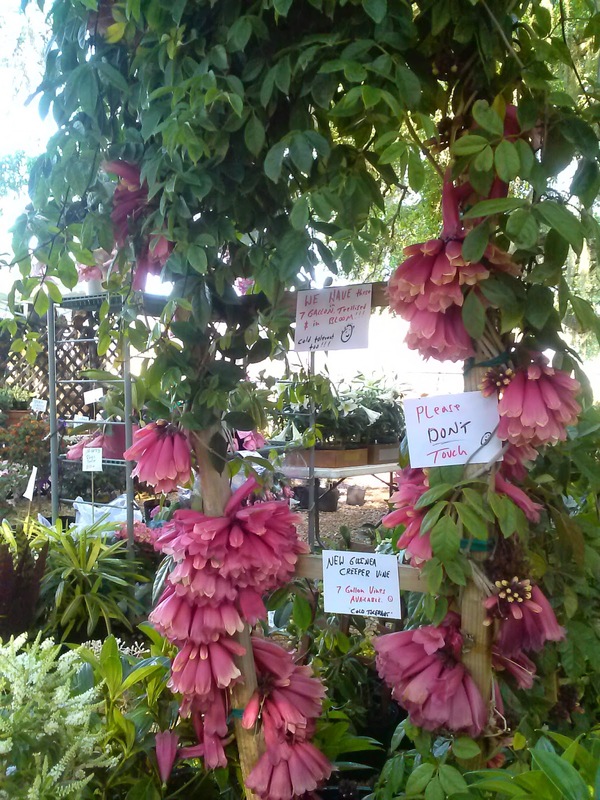 This is a new type of "Medinilla" plant...I wanted to get one, but they sold out quickly. The Croton Man always brings a great assortment to the show and his booth was very popular with the crowd. So, back to reality and the market tomorrow, and we have tons of new stuff. 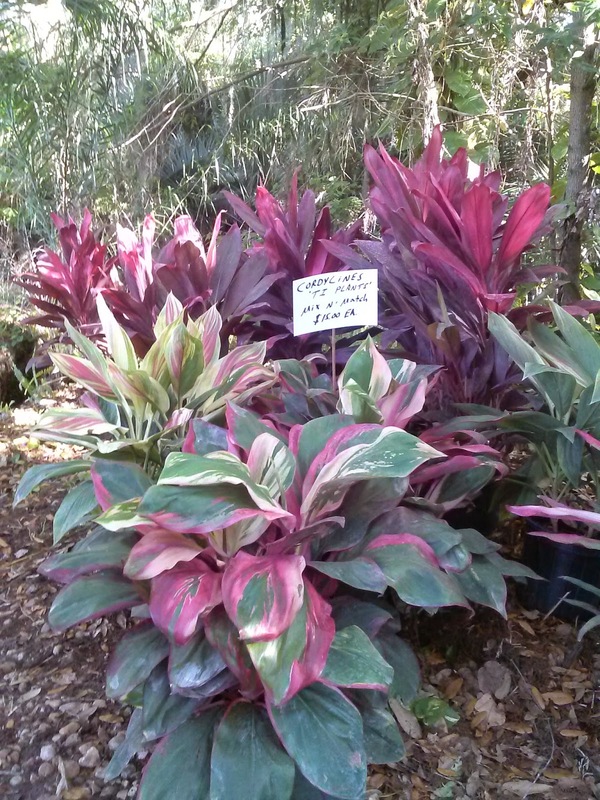 Many customers are looking for more plants for shady areas and house plants, and we have some very cool ferns and items that will fit the bill. Also, we are restocked on "Mini Tropicals" that are being used for Fairy gardens, terrariums, and just to sit on a windowsill to brighten your day. We are also restocked on all our Passion and Pipe vines, including the edibles. Mitch also has a very cool plant to bring, the "Leafless Orange Bird of Paradise", so be sure to come and check it out. And of course, the Tropical HOLLYHOCK season continues, we have Rose, Crimson, Purples, apricot and Yellows ! And, if you haven't done it yet, mark your calendars for the Green Thumb Festival, coming up on Sat/Sun, April 26 & 27th. 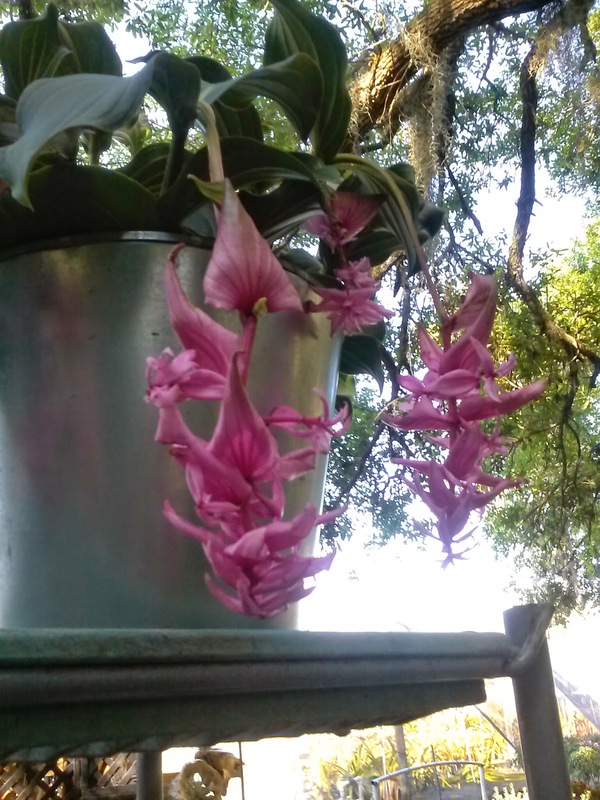 This is one of the most popular of all Florida Plant shows, and takes place right here in our hometown, at Walter Fuller Park, west side of St. Pete. Stay tuned as I will be talking more about it in the next week !